Choupani, M., Arabshahi-Delouee, S., Alami, M. (2014). Antioxidant Properties of Various Solvent Extracts of Lemon Verbena (Lippia Citriodora) Leaves. International Journal of Advanced Biological and Biomedical Research, 2(Issue 4 (2)), 494-500. Mahnaz Choupani; Saeedeh Arabshahi-Delouee; Mehran Alami. "Antioxidant Properties of Various Solvent Extracts of Lemon Verbena (Lippia Citriodora) Leaves". 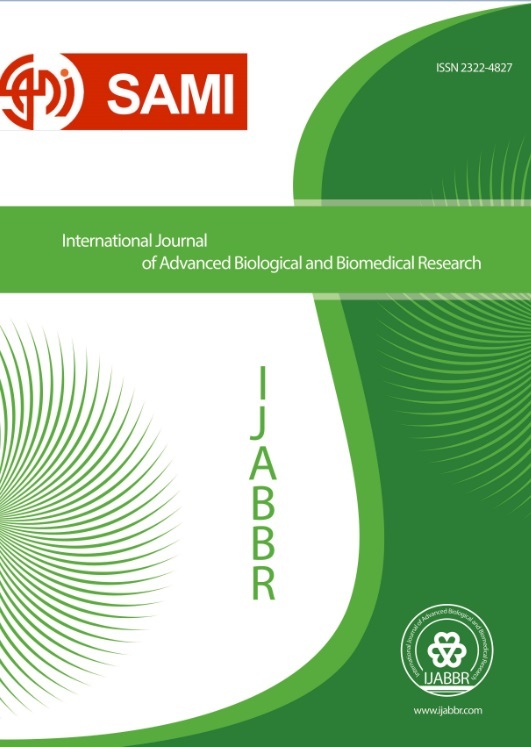 International Journal of Advanced Biological and Biomedical Research, 2, Issue 4 (2), 2014, 494-500. Choupani, M., Arabshahi-Delouee, S., Alami, M. (2014). 'Antioxidant Properties of Various Solvent Extracts of Lemon Verbena (Lippia Citriodora) Leaves', International Journal of Advanced Biological and Biomedical Research, 2(Issue 4 (2)), pp. 494-500. Choupani, M., Arabshahi-Delouee, S., Alami, M. Antioxidant Properties of Various Solvent Extracts of Lemon Verbena (Lippia Citriodora) Leaves. International Journal of Advanced Biological and Biomedical Research, 2014; 2(Issue 4 (2)): 494-500. Lemon verbena (Lippia citriodora) belongs tothe Verbenaceae (shahpasand) family. L.citriodora is chemical composition of the leaves plant have antimicrobial properties, refrigerant, anti-headaches one-sided, anti- pains nerve and housing, carminative, helping to digestion, relaxation, dizziness, colds therapy, memory Booster and etc. In this study, phenolic compounds of L.citriodora leaves were extracted with immersion method by acetone, ethanol, methanol and water. In this method, solvent type was found as an effective factor on the extraction. The highest amount of total phenol compounds was extracted by methanol which was 25/94 (mg Gallic acid per 100 mg of the extract). Among the solvents,acetone extremely had lower efficiency in the extracting phenolic compounds from the leaves of plant. Three complementary assays, reducing power of Fe (III), DPPH radical scavenging and total antioxidant capacity were used for analysis of antioxidant properties of various extracts compared with the synthetic antioxidant, BHT. In all tests, methanolic extract, which had the highest total phenolic compounds, showed the highest antioxidant activity although it was lower that of BHT. According to the survey results, L.citriodora leaves with a good source of natural antioxidants for use in food industry's.